This guide was created as a fact based and reliable resource for Australian gamblers seeking legally licensed online betting options. It is comprised of up to date information concerning the legalities and availability of Internet gambling for Australian residents, created by experienced industry consultants and analysts. There are a few key pieces of information we want to convey right off the bat. First of all, online gambling is perfectly legal in Australia. Our guide will focus on casino, poker and sportsbook gambling, though legal online lottery options and horse racing are also available to gamblers in Australia. Secondly, we want to provide you with a listing of destinations that can legally accept Aussie punters. These have each been vetted by our team of professional gamblers, and are verified to hold legal licensing and subject to regulatory oversight by a jurisdiction that has legalized online gambling in their region. They all offer a high quality experience, sophisticated security protocols, and an efficient banking suite for processing your transactions. These sites are considered to be among the most trusted brands offering legal online gambling to Australian residents. 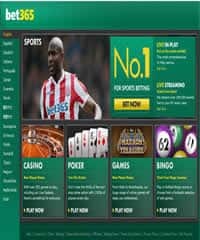 Bet365 is one of the largest and most reputable online gambling brands in the world. They are a multi-billion dollar company and are as classy as they honest. I don't know about you, but it's important for me to bet with only trusted sites that have a proven track record and have been in the industry for a long time. And that's exactly what Bet365 is. They have been around since the inception of online gambling, and have been one of the top flight names in the industry ever since. Quick Note: While bet365 is legally licensed to offer sports betting to Australian players, they cannot offer casino or poker gambling. If you are interested in playing casino or poker games, please choose one of our recommended sites below. In general, gambling is legal in Australia. The land based casino industry is regulated by the Casino Control Act of 2006, which provides oversight on how the casinos are allowed to operate. The law also provides guidance for the structure of state and territory gaming committees. The brick and mortar casinos in Australia are given the freedom to offer a wide selection of popular games, including the beloved pokie machines. Online casino gambling sites are permitted through the Interactive Gambling Act as long as they are associated with a land based casino, however they are not permitted to offer their services to local Aussie residents. That being said, the IGA does not prohibit Australian players from participating in offshore online casinos as long as they are licensed and regulated outside of Australia's borders. So to summarize, you won't find any of the local brick and mortar casinos offering online real money games, but there are many reputable and legally licensed international casinos that gladly accept players from Australia. The sites we recommend below all fall into this category and are extremely reputable sites. We also have a page dedicated to legal Australian online casinos that goes into much more detail. Sports betting is the one type of mainstream betting that is fully embraced in Australia. Not only is it perfectly legal to bet on sports as a resident, but it is also legal to operate an online sportsbook that caters to Australian gamblers. Therefor, Aussie sports fans have the option of betting at local Australian based sportsbooks or at legally sanctioned offshore sportsbooks. It is the best of both worlds. We have compiled a listing of the industry's leading online sportsbooks that accept Australian bettors, and have personally vetted each brand for quality, security and legitimacy. They each hold legal licensing and are regulated by a legitimate jurisdiction. The section below outlines our criteria for selecting the brands that we recommend to our visitors, and what is required to make it into our guide. We also have a complete section for legal online sports betting in Australia that offers a lot more information regarding laws and how it all works for Aussie punters. Are Online Poker Sites Legal In Australia? Australia has produced some of the world's greatest poker players including Joe Hatchem, Billy Argygros and Gary Benson, both previous winners of the WSOP. Australia has also hosted some of the most prestigious poker tournaments, such as the Asian Pacific Poker Tour and the Aussie Millions. Pub poker is very popular throughout the country as well. However, online poker is another story in the Land Down Under. It is not legal to operate an online poker site within Australia. The good news is that there are no restrictions regarding playing poker online as long as it is done at an online poker room that is located, licensed and regulated outside of Australia. The legal online poker restrictions in Australia are limited to operating an online poker site rather than participating in real money online poker gaming. The online poker sites we have recommended all accept Australian players, and are legally licensed and regulated. Aussie poker players will not be violating the IGA by visiting or betting at any of these destinations. You can read our legal Australian online poker guide if you want to read more on exactly what laws come into play and how it all works. The long-standing law governing online gambling in Australia has been the Interactive Gambling Act of 2001, also known as the IGA. The original writing of the IGA failed to clarify the legal status of all facets of online gambling, with online sports betting being the only platform explicitly defined as legal. This left the online casino and poker sectors in a gray area, allowing offshore providers to service Aussie players. The law was directed towards the owner operator side of the gambling market. The IGA makes it illegal for anyone who owns and operates an online casino within Australia's borders to offer their services to local residents. It also prohibits the marketing and advertising of their services to local residents, with hefty fines in place for violators. Online gambling operators based inside the country's borders must only accept players from approved regions outside of Australia. Now, a much-anticipated revision to the 2001 law has materialized in the form of the Interactive Gambling Amendment Bill 2016. The amendment has been successfully passed through all parts of the Commonwealth and is set to become law. The revised bill prohibits unlicensed international operators from servicing Aussie players. Unfortunately, the legislation fails to make provisions for how brands can acquire approval to enter the local market. The new IGA imposes a strict ban on iGaming providers and forced several big names like PokerStars and 888Poker to withdraw from Australia. Under the new law, online gambling becomes more difficult for local players. Anyone who gambles with an offshore brand is doing so at their own risk. These restrictions do not apply to online sports betting. It is legal to both own an online sportsbook and allow Australia's residents to place wagers. So as long as Aussie punters seek online casino and poker gambling at destinations based outside of the country, they are not at risk of violating any gambling laws in Australia. How Do I Know if an Aussie Friendly Gambling Site is Legal and Safe? There are actually many more elements of the businesses that we evaluate, but the list is far too lengthy to list in its entirety. The future does not currently look bright for online gambling in Australia. However, there is a chance for the new ban to be overturned. The Australian Senate’s Environment and Communications References Committee heard from local players, lawmakers and other stakeholders on the current state of online poker in the country. Arguments were presented on why legalized online poker is a much better option than the imposed ban on iGaming. The Committee is preparing a report detailing the findings of their inquiry into the current market and is expected to publish that report by September. If the report finds that legalized online poker is indeed the better option, the potential return of legal iGaming in Australia increases in likelihood. We are big advocates of responsible gambling. If anyone feels they are losing control or that gambling has become more than just entertainment, please visit the government problem gambling website for Australians and get some help.